This week's cover story examines the commandant's new efforts to address misconduct in the ranks and restore the notion of engaged leadership. The Marine Corps’ top general wants an end to the monkey business that, since the start of 2012, has cast a steady, unflattering light on an institution defined in no small part by the pride it exhibits in being a disciplined, moral fighting force. “We are allowing our standards to erode,” Gen. Jim Amos, the service’s 35th commandant, laments in an internal memo distributed to all of his generals, commanding officers and sergeants major. Known as a White Letter, the sharply worded missive comes in response to “a number of recent widely publicized incidents” involving Marines misbehaving abroad. Complacent leadership bears some of the blame, he says. To recap: In January, a video surfaced showing grunts in Afghanistan appearing to urinate on dead Taliban foot soldiers. A month later, Amos apologized on behalf of the entire Marine Corps for photos of deployed scout snipers posing with a flag bearing the Nazi-era SS logo. At the same time, three Hawaii-based Marines were court-martialed in connection with the war-zone hazing and subsequent suicide of Lance Cpl. Harry Lew. Since the White Letter was circulated, five Marines were implicated in separate prostitution scandals. One in Colombia and one in Brazil. Amos is worried the fallout from these embarrassing incidents will eclipse the progress Marines have made in securing Afghanistan’s Helmand province, though he is quick to note that, overall, Marines have fought the war “in a way that meets the high, almost lofty expectations of the American people.” He has directed leaders across the fleet to get smart on specific regional directives governing conduct abroad, and get tough in ensuring the rules are crystal clear to rank-and-file personnel. The Marine Corps’ reputation is at stake, Amos says. Additionally, the service will hold a daylong “ethics standdown” for all Marines in the coming weeks, and the commandant has launched a tour of bases and air stations to address his frustrations — and his expectations — and to point the way forward. 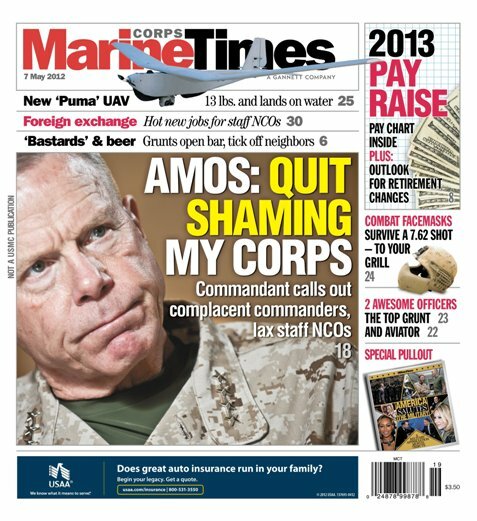 To learn what Amos has in store for Marines, pick up the current issue of Marine Corps Times. It’s on newsstands now. To read it immediately, click here and subscribe.